I believe that most successful chick raisers think that there is no one step in the management of baby chicks of greater importance to the vigorous and steady growth of the youngsters than the getting of them out onto the ground at an early age. The brooders are warm and dry. If the chicks cannot get away from these conditions there is danger of their little feet becoming very dry and then sore. The brooders are usually filled to their utmost capacity, and can be, if the chicks can be turned out into brooder runs within the first two weeks of their lives. When they are all kept together in the small inside brooder runs for many days they often start bad habits, such as toe picking. This very disastrous and very common trouble in artificially raised chicks can be avoided in the great majority of cases by getting the little fellows out of doors when about a week old – weather permitting, of course. I have seen chicks running on little snow banks outside the brooder house when less than two weeks of age and enjoying it. The doors were open and the owner saw to it that they went back into the house when they showed signs of getting cold. It knocked the toe picking habit on the head straight away, as well as made the chicks hardy and strong. This is the next important reason why chicks should be gotten out of doors in the yards as soon as possible. It gradually hardens them off and gets them accustomed to outside air and cooler temperatures. Chicks are then much better able to make the change from the brooder houses onto the summer ranges than those which have not been forced to get accustomed to outside conditions before actually being moved from the houses. 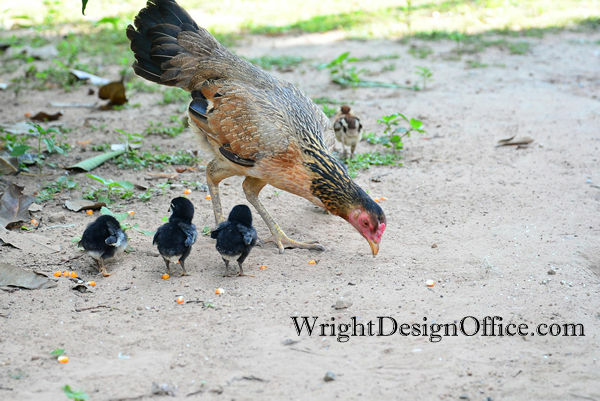 It is often surprising how many poultry raisers are afraid to get the little chicks out onto the ground yet when you see a mother hen out with her chicks running along behind trying to keep up, the first time is often within just a few days of them hatching. Chicks need an almost amazing supply of fresh air in order to grow unstuntedly during the first few weeks. Getting them out of doors where the great fresh air abounds unlimited is pouring vitality into their systems, provided, of course, that common sense is used in so doing. And then again, the baby chicks need green succulent food materials to help to keep their tender digestive systems in splendid working order. One idea for this especially as the Spring advances is by growing some green crop in the runs. To sum up the reasons why the baby chicks should have out-of-door yards or runs in addition to their indoor brooder quarters is to say that such a plan hardens them off, keeps them attracted and busy, tends to stop toe picking, keeps their little feet moist, supplies abundant fresh air and green food, and provides them with conditions which are Mother Nature in many details. Are not these reasons sufficient to warrant the serious consideration of everyone that wants to raise better and more vigorous chicks this year?